Home / Blockchain News / Cryptocurrency Series / What are DApps? - All you need to know. What are DApps? - All you need to know. You must have heard or read this word DApps somewhere on the internet mostly while going through cryptocurrencies or blockchain. 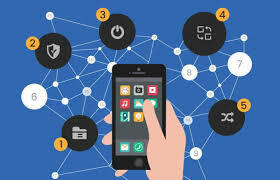 So, this DApps, commonly known as Decentralized applications is a new model which is being used to develop applications based on blockchain technology. The transparency, flexibility, resilience and distributed characteristics make it revolutionary in today’s world. DApps are not owned by anyone and the source code is available for all. This adds to the apps as anybody can access codes and contribute. As specified by its name, applications should be decentralized. All records should be stored in the public ledger. Every Apps has cryptographic tokens and contribution to the value should be rewarded in the token. The DApps uses Proof of work and Proof of stake algorithm. All DApps should have this algorithm or protocol to generate tokens. These tokens are used to store value and for transaction purpose. Based on its model DApps is classified into three categories. This type of decentralized applications has their own blockchain like bitcoin. Other altcoins like litecoin are also Type 1. Type 2 decentralized applications use the blockchain of type 1 DApps. Type 2 DApps are basically protocols and use tokens for their function. Forex omni protocol. Type 3 decentralized applications used type 2 decentralized application protocol. Golem is a type 2 decentralized application to establish the first global market for idle computer power. It is based on Ethereum blockchain and token is termed as GNT. Siacoin is a type 1 decentralized coin based on the private blockchain. This token is represented as SC. This is a type 2 decentralized application based on bitcoin’s Blockchain. It is basically a data storage network. Augur is a type 2 opensource decentralized prediction market platform based on Ethereum’s blockchain. The coin is represented as REP.
DApps is a wave to the cryptographic token and blockchain technology and is going to be the world’s largest software corporation in terms of decentralization.